Waiting out the nitrogen cycle in your new aquarium is one of the hardest tasks in the hobby. On one hand, you have a fully set up aquarium that looks ready for fish. You have probably spent hundreds of dollars and countless hours to get to this point; all you want to do it add fish! While this is understandable, properly cycling your aquarium is absolutely necessary. Building up a base of good bacteria is crucial for the health of your fish and will benefit you greatly in the long run. That being said, there are things you can do to speed up this process significantly. Adding filter media, rocks, or substrate from an existing tank is the single most effective thing you can do to speed up the nitrogen cycle in your aquarium. To understand why this works so well, you must first understand how the nitrogen cycle works. “Cycling” an aquarium is actually just the process of building up enough beneficial bacteria to remove Ammonia and Nitrite from the water column. These beneficial bacteria feed on Ammonia and Nitrite and convert them to less harmful compounds, which then can be effectively removed through water changes. Without these bacteria, fish waste would cause constant spikes in Ammonia and Nitrite. In short, your aquarium’s water would be poison to any fish in it. The reason that adding filter media from an established tank into a new one is so effective is because it jumpstarts the population of these beneficial bacteria. When starting a tank from scratch, bacteria must populate the aquarium one by one. It can take months for the bacteria to have a strong base population, and even then your tank will still be sensitive to swings. Adding filter media from a healthy tank will cut weeks off the nitrogen cycle timeline. Make sure the tank you get it from is healthy and none of the fish are sick! The beneficial bacteria necessary to complete the nitrogen cycle reproduce significantly faster in a warm environment. Since the end goal is to have tons of these bacteria swimming in your tank, it only makes sense to help them reproduce as fast as possible. During your cycle, it is best to have the tank temperature somewhere around 83-87°F. From my experience, these seems to be the “sweet spot”. Any warmer and you could risk messing up the cycle. Also, make sure you do not have any fish in your aquarium if you plan to use this method. Temperatures this high can be very dangerous for certain types of fish. Much like fish, Ammonia and Nitrite consuming bacteria require a lot of dissolved oxygen to thrive. Increasing the dissolved oxygen levels in the water will encourage strong growth in the beneficial bacteria population. This is especially helpful when combined with high water temperature, since warm water doesn’t retain oxygen as well. 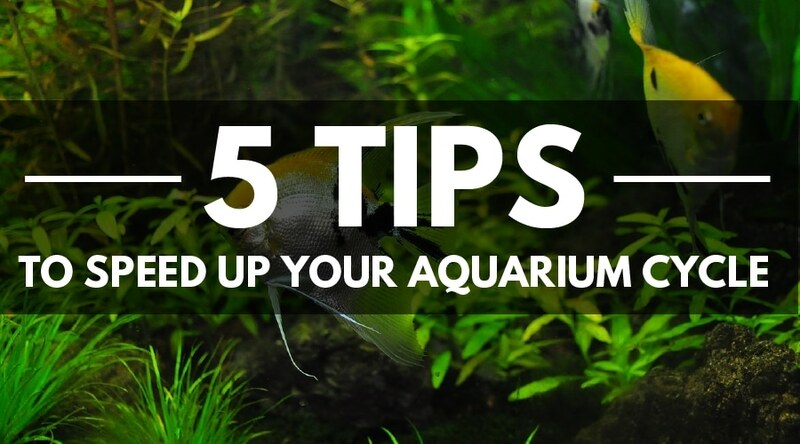 There are two ways to increase oxygen levels in your aquarium. First, you can add an air pump or air stone. 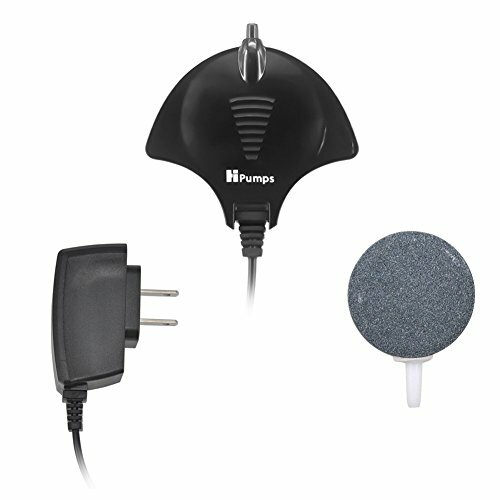 I personally use the Hpumps High Efficient Oxygen Air Pump . This air pump is quite and comes in very handy to stabilize the pH when I am mixing my own saltwater. Just let your air pump run in the aquarium 24/7 until you cycle is complete. No need to turn it off at all! ULTRA SILENT, No ELECTROMAGNETIC INTERFERENCE - Different from traditional electromagnetic air pump, No motor, No shaft, No EMI, which makes baby a good sleeping. RoHS and CE certificate passed. HEALTH - Using premium material and long lifespan. Suitable for 2-20 gallon tank. FISH LIKE AND LOW CONSUMPTION - Power consumption of this oxygen water pump is only 1.5W, but produce enough bubbles, fish like bubbles. Another way to increase dissolved oxygen content in your aquarium is by increasing water flow. To do this, get yourself a good set of powerheads or wavemakers and set them up in your aquarium. Make sure at least one of them is pointed at the surface and creates a good amount of surface turbulence. You can check out our list of the best powerheads and wavemakers on the market. It may seem surprising, but Nitrifying bacteria grows best in the absence of light. I know it is tempting to turn on your lights and witness the beauty of your newly set up aquarium, but its best to wait until after the cycle is over. Try to keep the tank away from windows as well, as sunlight can inhibit bacteria growth and cause massive algae growth, especially during the cycle. Filter media is one of the best habitats for Nitrifying bacteria; it receives constant water flow, little light, and is very porous. It may seem counterproductive, but letting your filter run during the cycle can help speed up the process greatly (especially if you can get a filter from a mature tank!). When your cycle is complete and you are doing regular water chances, make sure to NEVER rinse the filter media with anything other than tank water. Running sink water or other water containing chlorine through your filter will not “clean” it. All it will do is kill the Nitrifying bacteria and possibly reverse your entire cycle. I recommend putting a small amount of tank water into a bucket and softly swishing around the filter media during cleanings. This will help remove any detritus, but will not remove or kill beneficial bacteria. After all, these little guys are the most important things in your tank! Of all the tips I shared above, seeding your tank with established gravel/filter media is BY FAR the most effective. This technique alone can cut your cycle down from six weeks to under 24 hours if enough beneficial bacteria is present. You would be surprised how friendly people are in the fish-keeping hobby. Start checking out forums or go to local fish stores. Many people would be more than happy to give a piece of their filter media to help get the cycle started. Everyone knows how exciting it is to get a tank up and running, and most people are extremely willing to help. In my first saltwater aquarium, my local fish store gave me a few cups of sand from their display tank and my cycle took under a week. By following all the tips in this guide, you should be able to speed up the nitrogen cycle of your aquarium significantly. Make sure to take care of your beneficial bacteria, as they are the glue holding your entire tank together! Enjoy!